Tottenham sporting director Damien Comolli says the club is united behind coach Juande Ramos, despite their worst start to a league season in 96 years. Ramos's side lie bottom of the Premier League and pressure is mounting on the Spanish coach and Comolli. 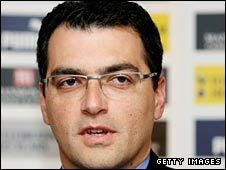 Comolli told BBC Sport: "We share the responsibilities. We are all together supporting each other and I'm sure we will turn it around." He added: "We need stability. We don't need change. We need to get results." Comolli has been criticised for Spurs' policy in the transfer market this summer, with boss Ramos admitting he is short of strikers after the departure of Robbie Keane to Liverpool and then Dimitar Berbatov to Manchester United just minutes before the transfer window closed. He said: "As a club we are very united - the board and the coaching staff, the players and the coaching staff, and the players and the board. We are in this together so we don't want to single out anyone." Comolli added: "We are not getting the results we thought we would get, but we are working hard and we are all committed in the club to getting it right and fixing it." He also rejected suggestions that his relationship with Ramos had broken down amid the club's early-season struggles and that his own position was now under threat, saying: "My relationship with Juande is excellent, as always. "That is all speculation. We don't talk about that inside the club. We just want to get out of this tricky situation."